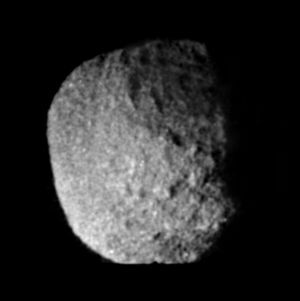 Proteus is the sixth moon of Neptune in order from the planet. Proteus was discovered in June 1989 by Voyager scientist Stephen P. Synnott from images sent back by Voyager 2. It is named after the shape-changing sea god of Greek mythology and is also known as Neptune VIII. Although Proteus is larger than Nereid, it was not discovered earlier because it is very dark (among the darkest objects in the solar system) and so close to Neptune that it is difficult to see in the glare of the much brighter planet. Proteus is thought to be about as large as a satellite can without being drawn into a spherical shape by its own gravity.